Blackberry Wood is a wonderful, secret and magic combination of Alt-Country-Gypsy-Circus music. A high-energy cabaret spin on both old and modern music, adding juicy flavours like jumpin' ska, skiffle, folk, punk ‘n many other irresistible body shakin’, foot stompin’ delights to their original and timeless ol’ style adventures. 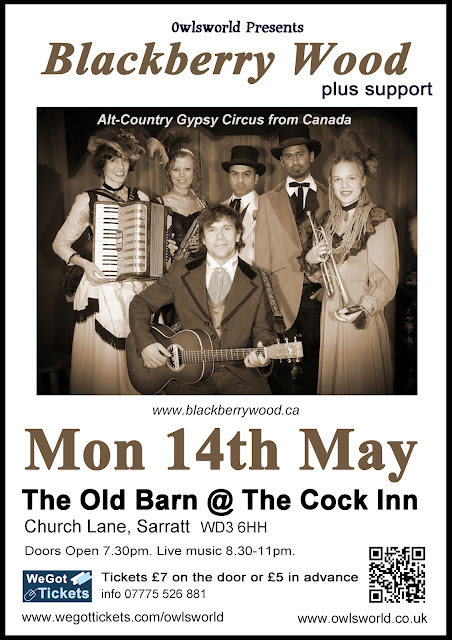 Blackberry Wood comes down the road like a travelling caravan, with all kinds of wondrous instruments, vocal melodies and fantastically costumed characters. Blackberry Wood has kicked up dust in towns all over Western Canada, the UK and the United States. "Were they country, were they rock, were they polka, or were they punk? Were they burlesque? Or were they just plain fun? Yes!" "A traveling band of gypsy-party musicians who bring the spirit of hokum to life with original tunes as well as with some brilliantly chosen, stunningly unexpected covers. Each show is unique. I adore them." Singer/songwriter Mark Handley is happy to embrace all styles of music, though Acoustic Roots, Rock and Reggae are certainly amongst his favourites! He has a natural “feel” for a rhythm and the uncanny ability to find and write a song in any situation or on any subject. These are “real” songs with great lyrics and hooks that will have you singing along by the second chorus.... as well as getting your toes a’ tappin’ (of course!) He knows how to entertain an audience and his energy and passion are sure to leave an impression on all those who have seen and heard him play. His following maybe small but the word is spreading and those who do check out his music usually come back for more.